Yesterday was the 14th of July in France. Heck, I’m pretty sure it was the 14th of July everywhere, but with time zones and everything, who knows. I just know yesterday was the 14th of July in France. It’s a big deal over here, you know, the French equivalent to our 4th of July. We spent a good chunk of it in Pornichet at the home of Luc and Isabel, good friends to Laurent and Frédérique. The six of us had lunch and then went to the beach, most of us braving the 62 degree water for a short swim. 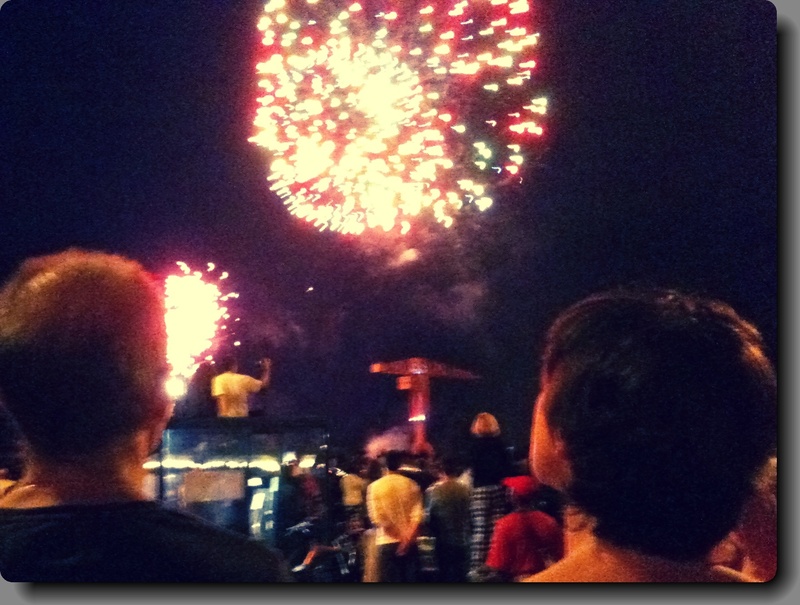 We returned to Nantes to see the feu d’artifice, which translates literally as artificial fire. Its actual translation is fireworks, and it being the 14th of July in France yesterday, there was a lot of artificial fire taking place. I took this photo of the event, trying to capture Laurent and Frédérique. I just read all of this blog and I have a sudden craving for cheese, wine, pastries, Melinda, and Andy.